Calling all journalists!!! Hey media! 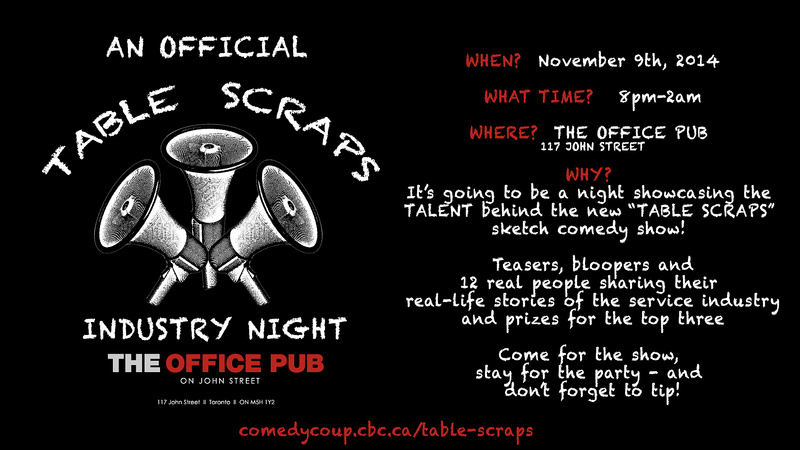 Frank Fiola is dying to tell you about a brand new comedy show that he's involved in: Table Scraps! I hope Table Scraps gets a shot at moving up. You guys keep delivering on the missions every week - just like the dedicated servers who keep delivering our meals and drinks every day! 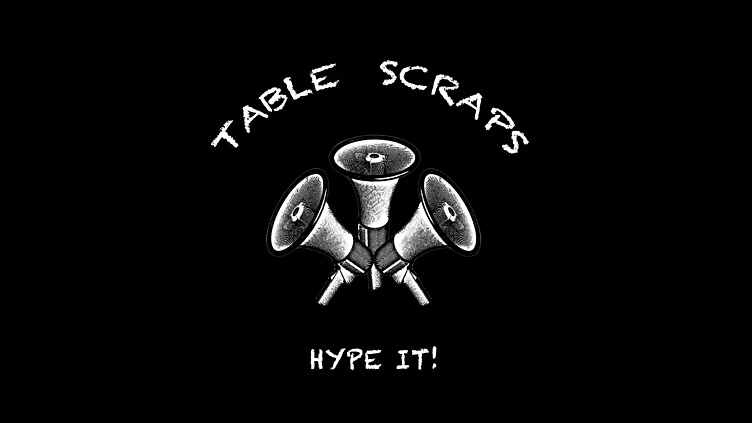 Just like the awesome people in the service industry - Table Scraps deserves some credit, some appreciation and some love! Rock on and keep it coming! This is the sell sheet for Table Scraps. Selling comes naturally to us service employees! Thank you and we hope to see you again! Table Scraps' Service Industry Night. 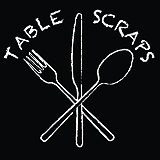 Come show us your support at an open mic night for Table Scraps. We want to hear your funny and weird stories from the service industry. 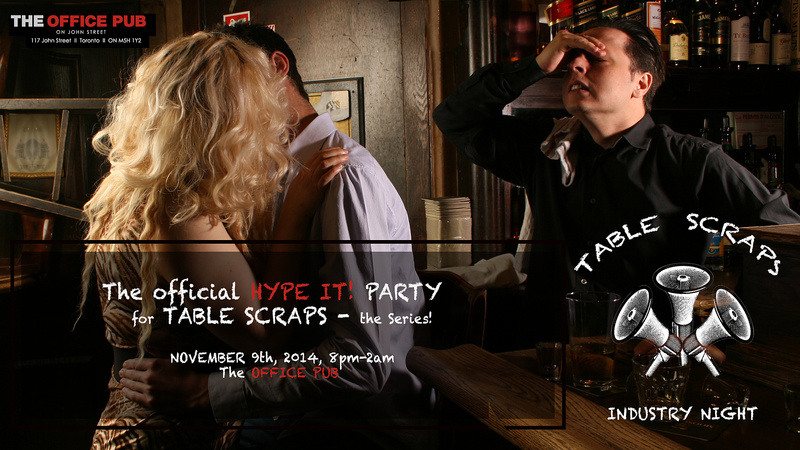 Let us show you what Table Scraps is all about : your work life! We'll have Music, videos, games and open mic for service industry stories. Prizes for the funniest work related Story! The audience will vote for three rounds. Prizes for 1st, 2nd and 3rd place winners! Having previous experience in the kitchen biz makes me like where this has been going. The hype definitely addresses as it should. Serve another one up please. Look forward to week 6.
a loooot of people have rich and painful stories they can tell about working in these jobs. Hope to see you in the top 15~! This hype-it video was very well done, I think. I liked the way you incorporated the text with the live actor. And, of course, it helps that your live actor is cute! Good luck. I like your industry promo event set in a pub. Way to bring your audience into your setting. Did you consider inviting people to that event in your 5th video? I did consider that. But, since we could only squeeze so much info into 90 seconds we had to pick and choose what would stay in the video and what would be cut. It's in our extended version on YouTube and advertised all over FB, Twitter, our website, instagram, tumblr, and not to mention twice here on ComedyCoup with a link to the FB event page. I'm glad to hear that you like promo! Thanks! Thank you, Willy! Appreciate the feedback. Okay, but how many sketches can you do with waiters and barristas and bartenders? Is every sketch going to be someone talking to someone across a table or counter and saying wacky and crazy stuff? That just doesn't really seem to have much longevity. Trust me.......we have loads of material. Enough for a series of ten or more seasons. If you've ever worked in the industry, you'd know what I mean. I can see there can be a lot of stories you can do with the service industry with many characters and storylines. Maybe the pitch video should have shown that a bit more. Good luck it is a good idea. Thanks Sheldon! Hope to see you there! You certainly have lots of material to work with since you have chosen to target the service industry in your videos. I really think the name of the show is catchy and you were able to sell the concept this week. this weeks video showed a lot of good content and you are great in front of the camera, very engaging. At times it was a bit boring but overall well done. The sell sheet showed your characters and idea very nicely. good luck and keep working on this idea! Thanks Carly! As always, we appreciate your input. I can imagine what waiters and barristas go through each day. You guys seem to have a good team behind you. I could never be a waiter, and after watching these videos, I have to say, I feel sorry for everyone in the industry! Customers are so weird! Keep your chins up!